Can you please take us through your writing process? I've tried everything from outlining to just writing and I find that my ideal process varies for each project but generally lands somewhere in between (closer to the "just writing" side of the scale). I spend an excessively long time on the first three chapters, as getting the beginning of a story right makes all the difference. I write linearly, meaning I don't write chunks from all over the book and paste them together. Inevitably, as I get further into the book and plot, I realize how many things I need to change in the first half. When I start dwelling on those, I stop and go back. It's a mental thing. I need to see the right story progression before I can finish a book. Even if I know what must be changed, I get to a point where I just can't continue until I fix it. Where did you get the idea for the Ten Tiny Breaths series? The idea for the first book just kind of hit me (I know people who have been involved in drunk driving incidents). I didn't see the entire story for what it was at the time; I just knew I wanted to paint a picture of how dangerous and life-altering drinking and driving could be. While writing Ten Tiny Breaths, did you ever think that you would be writing an entire series? LOL NO! I didn't realize how much people would love all of the other characters from the series until after TTB was released and the reviews started coming out. 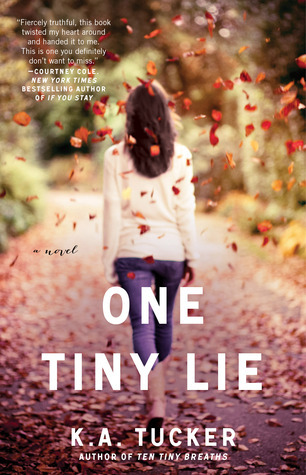 What can your readers expect from One Tiny Lie? ONE TINY LIE is different from TEN TINY BREATHS. It's set three years after TTB, and it's told in Livie's voice (which is very different from Kacey's voice) as she goes through the growing pains of learning that the life she mapped out for herself isn't the one she truly wants. less abusive and no love triangle..